The first floor is the most comfortable furnished because has been serving for residence. Furnished for the most part inventory of the 19th century, and precious furnaces. Above all doors are intricately carved coats of arms of families with whom Draskovic's come in marital relationship. As for the entire first floor in this room furniture was commissioned by the owner. Furniture makes: a large built-in wardrobe, corner cabinets, leather-covered chairs and a coffee table with sink. Through a small door in the wall was brought in food that was transported via elevator from the kitchen. Most of the dishes and small accessories perished in World War II. Presented was only part of the preserved porcelain tableware (18th-19th century). In the southern part of the protruding main building there is a small lounge where nobility indulged with fun games of their period. Painted wall decorations appear idyllic country life of 18th century, originated on the model of the then French tapestries. This was the only room in the whole castle where allowed to smoke. Furniture with gambling table is from the 19th century, a mangal (vessel for heating) of Oriental origin. 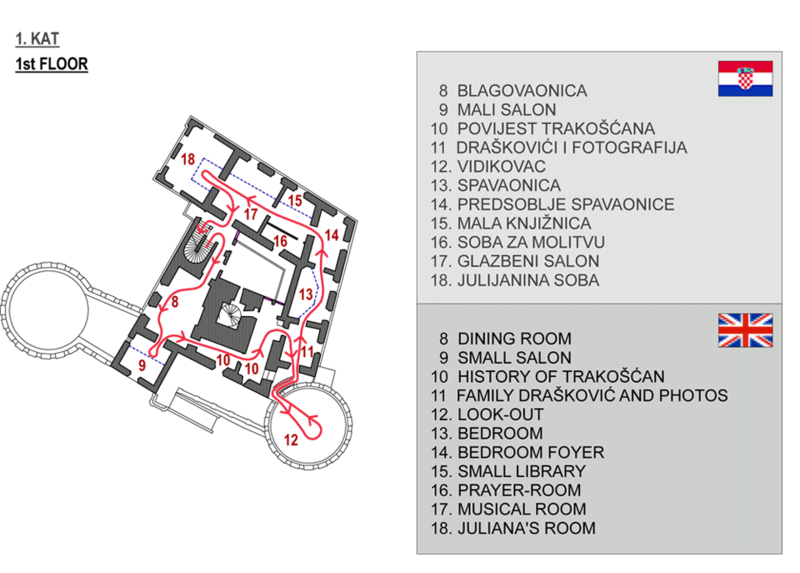 Two premises in which there is a brief history presented Draskovic family and castle of Trakošćan not, as most of the rooms, interior decorating. Emphasis is placed on billboards depicting historical documents (Grant, coat of arms) and a brief description of the history of the estate and the most important members of the family. From the original museum collection, here are, however, placed four historic flags from the legacy of counts Draskovic's. When we talk about photography in Croatia, we can not escape nor two family members Draskovic. One of the pioneers of photography in Croatia was Count George VI. Draskovic, who remained in the history of his military career as a reformer of Trakošćan. Two albums confirmed him as the author of our earliest surviving photographic oeuvre. He has made a number of calotypes (earliest procedure for obtaining photographic images with the help of negatives and prints on paper). In year 1865 he made and so far the the first known act in Croatian photography. Dubbed the Jurimirska maid, and his posture betrays the influence of nudes painted by Mihael Stroy. Another Draskovic of crucial importance in the field of our photography, was Charles. He is considered one of the pioneers of art photography in Croatia and most important Croatian amateur of 19th century. He achieved the ultimate visual and technical excellence of photography and was admitted to membership of one of the most prestigious European Photo Club Wiener Camera Club. For this numerical holdings especially important stop-motion footage (Stephen Erdödyja Jump, L. Odeschalchy highboard diving) and naturalistic portraits of people from the margins, which directs Croatian photography toward social issues. The bedroom of the owner of the castle set in a unique neo-baroque style. In the bedroom is especially pointed out coffered ceiling and white tile stove made ​​in the form of tower. It is interesting that this furnace is almost completely true copy of the furnace from burg Fuessen at Lech in Germany from the 1514 year. Anteroom to style and functionality builds on the bedroom. Here there are two large wardrobe, cupboard and mirror standing family crest. Unfortunately, luxurious clothing that were once kept in these cabinets, are not preserved. Certainly we need to point out the portrait of the Empress Maria Theresa, one of the most powerful and the most important woman in the history of Europe. Small reading lounge is equipped with furniture, wall decorations and an open fireplace in neo-Gothic style. Preserved original stuffed wallpaper from the time of the previous restoration of the castle, colouristic are compatible with the rest of drapery and clearly illustrate the salon atmosphere of the late 19th century. furniture distinctive neo-Gothic forms are: a large closet that served to accommodate books, sofa, chairs and armchairs. Making Trakošćan historicist furniture entrusted to skilled craftsmen and high quality, and this is best illustrated in the small library. This is a reconstruction of the castle family chapel. Today it is part of the sacred items from the estate of the Draskovic family. In the place of the altar, which was not preserved, presented a gilded monstrance decorated with precious stones and two chalices also 18th century. On the walls are paintings of religious themes of which occupies a central place Pieta, by an unknown artist of the 18th century. addition to the pictures, here is a baroque sacristy cupboard with richly carved shackles. A special place occupies well preserved and richly illustrated bible from 1747 year. In past centuries, one of the aspects of fun it was playing on the noble courts. In this room are most often resided, so it is lavishly decorated, richly decorated with painted and gilded carvings and furnished neo-baroque furnishings. Piano is from famous Viennese workshop of Conrad Graff, and the furnace is in the 18th century in Rococo style. Juliane room is reconstruction of a painting studio Countess Juliana Erdődy Draskovic (1847-1,901). Although not made ​​great opus, Juliane marked the beginning of our Munich academic realism. Born in 1847 in Bratislava, in the branch of the family Erdődy who had their possessions in Bratislava and New Marof. All of her surroundings in work and daily life to stay Trakoscan, is still in the studio with an easel, chair color palette, piano and pictures. There is also a significant part of her oeuvre, and certainly noteworthy portraits of women in traditional costumes from around Trakošćan portrait of her husband John, and a self-portrait with piano. In addition to its image in the corner of the studio, there are portraits of Juliana Draskovic and her sister Valerie Erdődy painted by Johann Till around 1870s. Elements such as window curtains, carpet and mangal area give an oriental spirit, very popular in the late 19th century. Interesting neo-Gothic furnace is heated with hot air which is circulated from the lower furnace room.